What demographics are to people, firmographics are to organizations. I am currently working with starting up a Business-to-Business (B2B) service. In order to assess the market I had to know something about how many companies there are out there who possibly could be in need of such a service. The service will work word-wide, but adhering to the sayings about thinking globally/big and starting locally/small I have started with assessing the Danish market. Also there are easy and none expensive access to business directories for Denmark. My first filter was selecting companies with at least 50 employees. As the service is suitable for companies within ecosystems of manufacturers, distributors and retailers, I selected the equivalent range of industry codes. In this case it was NACE codes which resembles SIC codes and other classifications of Line-Of-Business used in other geographies. 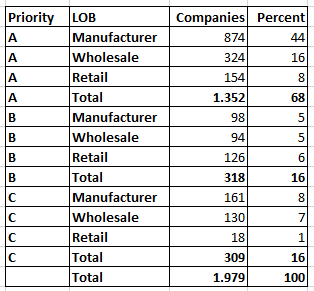 There were circa 2,500 companies in my selection. However, some belong to the same company family tree. By doing a merge/purge with the largest company in a company family tree as the survivor, the list was down to circa 2,000 companies. Priority A: Building materials, furniture, houseware, machinery and vehicles. Priority B: Electronics, books and clothes. Priority C: Pharmaceuticals, food, beverage and tobacco. Retailers that span several priorities were placed in priority B. Else, for this high level analysis, I only used the primary Line-Of-Business. So, from my firmographic analysis I know the rough size of the target market in one locality. I can assume, that other markets look more or less the same or I can do specific firmographics on other geographies. Also, I can apply first results of dialogues with entities in the breakdown model and see if the model needs a modification.